Big Game Theory! 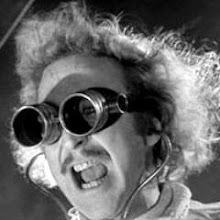 : Rethinking Emissary for the "Red Frontier"
Since then, it’s been a lot of fine tuning over the years to get the balance and pacing smoothed out. The biggest change has been to rethink the victory conditions to be something that doesn’t require as much arithmetic to forecast, as that can be a major source of AP or slowdown. But more importantly, I really prefer games where the victory trigger is discrete. By this, I mean games where there is a single condition that if a player meets it, they win instantly. Taluva is a favorite game of mine. 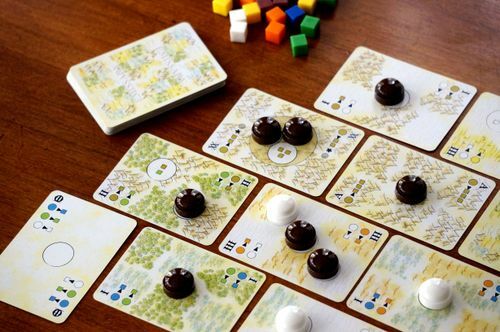 It’s an abstract tile placement game where you also have three different types of buildings to place, each with their own conditions for placement. If a player gets all of two of three types of buildings down, they win. The backup is that if you run out of tiles, the player with the most huts wins. I looked into doing something similar to Taluva for Emissary. Eventually, I settled on a system where there are three specific objectives to work towards, and if player can complete two of three they win immediately. One objective, Might, is based on building a region of a certain size (e.g. 5-cards) and having the most influence within that region. Another objective, Economy, is based on building a trade network, with 4-cards of the same rank adjacent. The last objective, Authority, is based on having the most power on Crown cards (and least two controlled crowns). These objectives do wonders for orienting the gameplay towards more discernable goal posts. They also create more reasons to conduct certain actions, such as “Replace” to swap cards in the map as well as Hostile actions to push players out of key cards. Of course, there is a backup goal system (a much simplified version of the original scoring system) in the event that the map is built out and no one manages to secure two objectives first. * Crowns cards in your hand are strong for winning conflicts, but playing them to the map is also needed to achieve am Authority victory. * Aces are powerful defensively, but can be discarded for three resources, which can open up a lot of options for the Influence Action. * Getting adjacent ranked cards is great for building up resources and working towards the Economic victory, but often makes it harder to effectively network a large region of the same suit together. * Always tough to decide what cards to discard: do you keep a card for future use on the map, for resources when you need them, for winning conflicts? * Moving influence is a cheap way to get onto a card that would otherwise be expensive to influence, but it is less efficient in terms of actions. * Exploring is good, but has to be timed to not give your opponent an opening to influence the card first. * Crowns on the board can help anchor your position on the board, but they can easily cut off regions and make it hard to connect. * Tier 1 cards are cheap to influence, but don’t let you concentrate power very well. * Tier 3 cards can let you concentrate power, but often gives your opponent an opening to build onto them as well - and they are expensive. * Sharing influence on an card with an opponent may get you (or them) bonus resources through trade, but might let them (or you) get closer to meeting a victory condition. Having patted myself on the back for the design work, there still remained one further struggle. One of the big struggles in the design of Emissary, around which I finally made a breakthrough, has to do with theme. 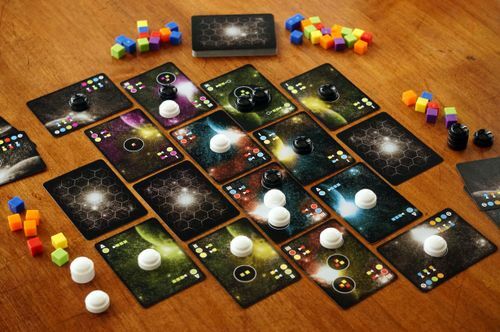 Admittedly, Emissary is quite an abstract game mechanically, and so any attempts to theme the game need to be taken with a grain of salt. That said, I was never very satisfied with my efforts to theme the game previously. Emissary’s theme started out as a play on the Decket’s mythos about being from the land of purple and red and sending Emissary’s to gain influence among various roving clans. It sorta worked. From there I was tinkering ideas for a proper space 4X theme or alternatively some terrestrial fantasy theme. The challenge is that the design of the game is really dual layered. One layer is the map and specific suits each cards represent. What are these suits? Roving clans? Foreign space empires? Migratory fantasy races? Floating islands? Then comes the question of what the players represent via the layer of their influence over the cards. Is your influence goodwill? Spies and secret agents? Political clout? Mechanically, it was important that a major action be the replace action, allowing you to swap cards on the map around - but it was hard to rationalize what was being swapped from a thematic standpoint. Long story short, I settled on an idea that I finally feel excited about. It started with a Popular Mechanics article about Mars colonization, that led to me this NASA research paper, about in-situ resource utilization on the Red Planet. It’s a pretty cool read. And so it may be a tad in vogue, but the wheels were turning and I had a compelling idea for theming Emissary at last. 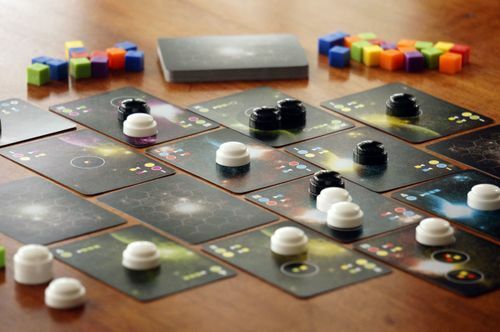 The basic premise is that players represent different enterprises working to prep a new frontier region of the Martian surface for colonization. This prep work is done by working with six different guilds to leverage their expertise in terraforming and building critical infrastructure. 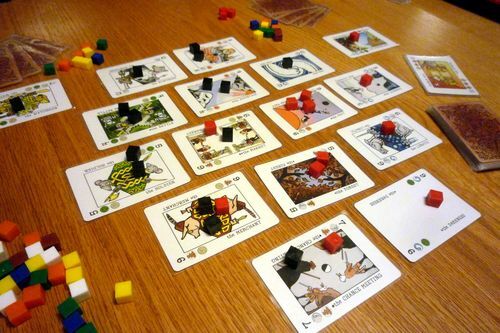 The first player able to fulfill two “contracts” (i.e two of the three special victory objectives discussed above) first gain the right to colonize the region and earns the favor of the guilds. Obviously this retheming will require revamping the background artwork for the game. I have a few ideas for this, but it will take some tinkering before it’s ready for public consumption. The last element, is the name of the game. While I like Emissary as a name quite a bit, it doesn’t really fit the new theme all that well. After churning through a bunch of different ideas (including lots of really bad puns) I settled on one that I like (for now): Red Frontier. Or maybe it is just Wild Red (like Wild West, but you know, on Mars). Or maybe the full name is: Wild Red Frontier. Gosh, or maybe it’s Emissary: Red Frontier. Hmmm. Seems like there is more work to do after all! Thanks for tuning in and let me know what you think!